Revel displays its PerformaIC15 In-Ceiling Loudspeaker at thisCEDIA Expo. No local pickup option is available. THIS ITEM IS NEW AND IN A SEALED BOX. Item Condition. Long-throw woofer design with rubber surround for high output and low distortion. includes both round and square zero-bezel magnetic grilles. grilles are paintable to match your décor. tweeter is aimable to direct high-frequency details towards you. Speaker will arrive in great condition and ready to use. 200 is the lowest I will go, Used once’s for a demo, worked great!!! Still have box they came in. Paid 225 for each one. Willing to sell separate or as pair. Would like 150 each. 8" In-ceiling Loudspeaker HIGH-FREQUENCY DRIVER COMPONENTS 1" Aluminum-Dome Tweeter with Waveguide LOW-FREQUENCY DRIVER COMPONENTS 8" Aluminum Cone, Cast-Polymer Frame Woofer RECOMMENDED AMPLIFIER POWER 10 - 100 Watts RMS SENSITIVITY 88dB MOUNTING Mounting Depth: 3.7" (94mm) WEIGHT 4.4 lb (2kg) / Shipping Weight: 6.3 lb (3kg) Revel In Wall Speakers. Shipped with USPS Priority Mail. Revel speakers are professional audio file speakers. The level of engineering and design that went into these speakers are incredible. If you're looking for a 2.1 speaker set up with depth, clarity, liveliness, and an incredibly convincing sound, this is it. Revel Concerta C10 on wall center channel speaker black. New in box. Concerta Series, 2½-Way Center Channel On-Wall Loudspeaker. 4-1/2" (113mm). 22-15/16" (582mm). 4-1/4" (107mm). Piano black or mahogany finish. Up for sale is a Revel by Harman C383 8" In-Ceiling Architectural Loudspeaker. The loudspeaker is unused in an opened box. tweeter is aimable to direct high-frequency details towards you. long-throw woofer design with rubber surround for high output and low distortion. Really nice monitors with excellent imaging, a detailed and engaging midrange, and remarkably deep and articulate bass for a monitor at this price point. There are three small blemishes on one of the cabinets (see the white arrows on the last two images). Have a New Revel Performa3 B110 10", 1000 Watt Powered White Subwoofer. Never been plugged in, clear plastic protective wrap has yet to be removed from the unit. This can be seen best from the pictures of the top of the unit. 3 channel on wall loudspeaker. Includes wall-mounting bracket. 40"w x 4.5"h x 4.5"d.
Frequency Range -3 dB from 32Hz-28kHz; -10dB from 23-35 kHz. Advanced high-order crossover network. Nominal impedance: 8 ohms. Includes zero-bezel magnetic grille. New stands only opened to inspect. Two stands in the box. Condition is New. MFR # W383. weight: 4.9 lbs. mounting depth: 3-3/4". sensitivity: 89 dB. Other Notes: "The C32 mates with the F32 floor-standing loudspeaker and the M22 monitor. Trade: Make your budget go further with a generous trade-in allowance. Let us know what you have available, and we’ll get you the best possible trade-in allowance. 8" In-Wall Loudspeaker. Sale is for One Speaker Only. LOW FREQUENCY EXTENSION. (Unless Sold AS IS). REVEL CONCERTA B120 ACTIVE SUBWOOFER 250w! NEW IN BOX. Condition is New. Shipped with FedEx SmartPost. 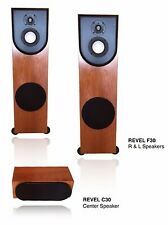 Revel Studio2 Speakers Mahogany (reg. $16,000) EXCELLENT! Grills included, but not pictured. harman revel performa 3 10 inch black subwoofer. 2 1/2-way Triple 6.5" Floorstanding Loudspeaker. 1" Aluminum Tweeter with Acoustic Lens Waveguide. 3 x 6.5" Aluminum Cone Woofer. (Unless Sold AS IS). LOW-FREQUENCY EXTENSION. 600Hz, 1.8kHz. 44.25" x 9.65"x 12.2" (112cm x 25cm x 31cm)—Including Feet. Revel by Harman W563 6" In Wall Architectural LoudSpeakers NEW! SALE IS FOR ONE SPEAKER ONLY. (Unless Sold AS IS). The speakers are in great condition. We stand behind our products! Color is silver. Your help is always appreciated. Revel Performa 3 M106 Bookshelf Speakers w/ Original Boxes & Manual - Nice! For sale is a neat pair of Revel M106 bookshelf speakers, in very good used condition. The High Gloss Walnut finish provides a sleek look and blends easily with your existing decor. On top of that, they have impressive dynamic detail and imaging. YOU ARE BUYING 1 PIECE OF REVEL CONCERT IW 65 SPEAKER. REVEL CONCERTA B120. Gold, SIlver, Firearms, Electronics, Tools. Things I Buy. Up for sale are a USED PAIR of Revel Studio 2 Tower Speakers in Gloss Black that are in good condition. These speakers are in very good condition and has a couple flaws of minor swirls in the gloss black finish on top the cabinet. Pair of Great sounding Revel Performa F32 in Natural cherry finish. Very minimal sign of use. They are well taken care. Revel Ceiling Speaker IC-6T2 Home Speaker 6.5"
Offers Welcome - REVEL Performa3 M126Be Hi-Gloss-Black Beryllium $4000 list! Revel Performa M126Be Bookshelf Speaker. - The Revel Performa M126Be has the best detail of any speaker I’ve heard. advanced high-order crossover optimizes timbre accuracy both on-axis and throughout the room. Revel by Harman, Revel C763 in-ceiling speaker. Condition is New. Shipped with USPS Priority Mail. This is a Revel C363DT in ceiling speaker. Revel W580 In-wall architectural speakers 8". 1 Speaker. 2 speakers are available. 6 ½" In-Wall Loudspeaker. Lightly used. Speakers Include Speaker Grill, however one of them is slightly bent. (Unless Sold AS IS). This Crossover is in good working condition! Revel C780 in-ceiling speakers (PAIR) NIB Reduced price.!. Revel C780 in-ceiling speakers (PAIR) NIB Reduced price.!. . Shipped with FedEx Ground or FedEx Home Delivery. Long-throw woofer design with rubber surround for high output and low distortion. tweeter is aimable to direct high-frequency details towards you. SALE IS FOR IN SPEAKER ONLY. boundary compensation switch adjusts low-frequency output when the speaker is placed near a corner. This Crossover section for a Midrange is in good working condition! RIGID DESIGN To preserve sound quality, the I20 and I30 feature rigid cast aluminum baffles that are far less prone to flexing than their plastic counterparts. To avoid coloration, the I20 and I30 are designed to maintain consistent sound quality over a wide range of angles. Revel IC15. Condition is New. Shipped with USPS Parcel Select Ground.